Definition at line 68 of file llviewerregion.h. Definition at line 345 of file llviewerregion.h. Definition at line 81 of file llviewerregion.cpp. References LLDLinked< Type >::append(), calculateCenterGlobal(), LLSurface::create(), from_region_handle(), gNoRender, initStats(), mCacheEnd, mCacheStart, mCompositionp, mLandp, mOriginGlobal, mParcelOverlay, mWidth, NULL, setOriginGlobal(), LLSurface::setRegion(), and LLVLComposition::setSurface(). Definition at line 161 of file llviewerregion.cpp. References LLVLManager::cleanupData(), LLHTTPSender::clearSender(), LLCloudLayer::destroy(), disconnectAllNeighbors(), gObjectList, gVLManager, gWorldPointer, LLViewerObjectList::killObjects(), mCloudLayer, mCompositionp, mEventPoll, mHost, mLandp, mParcelOverlay, and saveCache(). Definition at line 504 of file llviewerregion.cpp. References SIM_ACCESS_MATURE, SIM_ACCESS_MIN, SIM_ACCESS_PG, and SIM_ACCESS_TRIAL. Definition at line 462 of file llviewerregion.cpp. References SIM_ACCESS_DOWN, SIM_ACCESS_MATURE, SIM_ACCESS_MIN, SIM_ACCESS_PG, SIM_ACCESS_STR, and SIM_ACCESS_TRIAL. Referenced by getSimAccessString(), LLWorldMapView::handleToolTip(), LLPanelPlace::processParcelInfoReply(), and LLFloaterRegionInfo::processRegionInfo(). Definition at line 1071 of file llviewerregion.cpp. Definition at line 994 of file llviewerregion.cpp. References LLVOCacheEntry::getCRC(), LLViewerObject::getCRC(), LLVOCacheEntry::getLocalID(), LLViewerObject::getLocalID(), LLDLinked< Type >::getNext(), LLDLinked< Type >::insert(), MAX_OBJECT_CACHE_ENTRIES, mCacheEnd, mCacheEntriesCount, mCacheMap, mCacheStart, and LLVOCacheEntry::recordDupe(). Definition at line 694 of file llviewerregion.cpp. References gAgent, LLAgent::getCameraPositionGlobal(), getCenterGlobal(), and mCameraDistanceSquared. Definition at line 686 of file llviewerregion.cpp. References LLSurface::getMaxZ(), LLSurface::getMinZ(), mCenterGlobal, LLVector3d::mdV, mLandp, mOriginGlobal, mWidth, VX, VY, and VZ. Referenced by LLViewerRegion(), setOriginGlobal(), and LLSurfacePatch::updateVerticalStats(). Definition at line 423 of file llviewerregion.cpp. References gAgent, LLAgent::getID(), getOwner(), isEstateManager(), and LLAgent::isGodlike(). 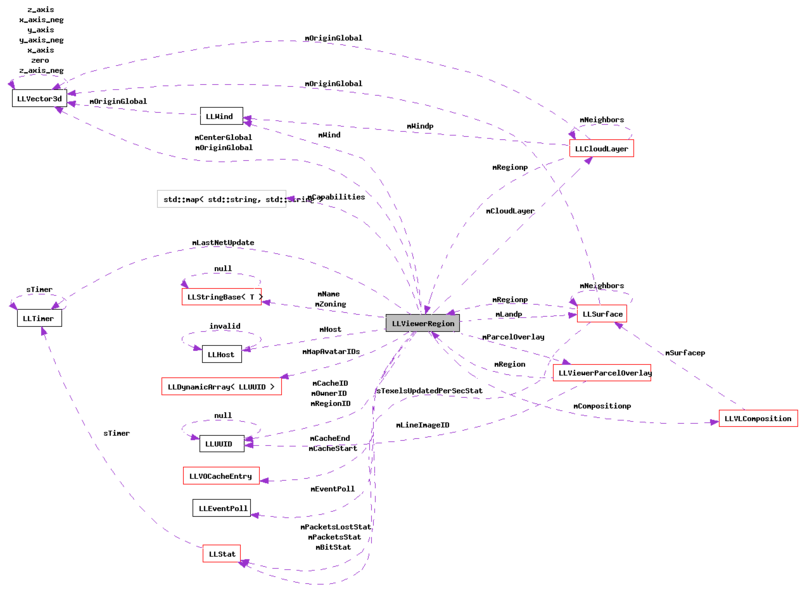 Referenced by LLAgent::canManageEstate(), LLToolBrushLand::canTerraform(), LLObjectEnableReturn::handleEvent(), LLFloaterRegionInfo::processRegionInfo(), LLPanelRegionTextureInfo::refreshFromRegion(), LLPanelRegionDebugInfo::refreshFromRegion(), and LLPanelRegionGeneralInfo::refreshFromRegion(). Definition at line 582 of file llviewerregion.cpp. References LLCloudLayer::connectNeighbor(), LLSurface::connectNeighbor(), mCloudLayer, and mLandp. Definition at line 547 of file llviewerregion.cpp. Definition at line 589 of file llviewerregion.cpp. References LLCloudLayer::disconnectAllNeighbors(), LLSurface::disconnectAllNeighbors(), mCloudLayer, and mLandp. Definition at line 1153 of file llviewerregion.cpp. References LLDLinked< Type >::getNext(), i, llclamp(), llendl, llinfos, mCacheEnd, mCacheEntriesCount, mCacheStart, and S32. Definition at line 572 of file llviewerregion.cpp. References f, LLViewerParcelOverlay::idleUpdate(), LLSurface::idleUpdate(), mLandp, and mParcelOverlay. Definition at line 351 of file llviewerregion.h. Referenced by handle_region_dump_settings(), LLPanelLandOptions::onCommitAny(), and LLStatusBar::refresh(). Definition at line 381 of file llviewerregion.h. Definition at line 356 of file llviewerregion.h. Referenced by handle_region_dump_settings(), and LLWorldEnableCreateLandmark::handleEvent(). Definition at line 361 of file llviewerregion.h. Referenced by handle_region_dump_settings(), and LLWorldEnableSetHomeLocation::handleEvent(). Definition at line 391 of file llviewerregion.h. Definition at line 113 of file llviewerregion.h. Definition at line 376 of file llviewerregion.h. Referenced by LLAgent::canFly(), handle_region_dump_settings(), process_agent_movement_complete(), process_sim_stats(), and LLStatusBar::refresh(). Definition at line 1405 of file llviewerregion.cpp. Referenced by copy_inventory_from_notecard(), LLPanelPlace::displayParcelInfo(), LLTextureFetchWorker::doWork(), LLFloaterIMPanel::draw(), LLVoiceChannelGroup::getChannelInfo(), LLFloaterIMPanel::inviteToSession(), LLIMMgr::inviteUserResponse(), LLFloaterReporter::onClickSend(), LLVoiceClient::parcelChanged(), LLViewerChatterBoxInvitation::post(), LLVoiceClient::requestVoiceAccountProvision(), LLLiveLSLEditor::saveIfNeeded(), LLPreviewLSL::saveIfNeeded(), LLPreviewNotecard::saveIfNeeded(), LLPreviewGesture::saveIfNeeded(), send_stats(), LLPanelClassified::sendClassifiedClickMessage(), LLPanelClassified::sendClassifiedInfoRequest(), LLWorldMap::sendMapLayerRequest(), LLFloaterPostcard::sendPostcard(), LLTextureFetch::sendRequestListToSimulators(), LLPanelRegionGeneralInfo::sendUpdate(), setSeedCapability(), LLFloaterReleaseMsg::show(), LLVoiceClient::stateMachine(), and upload_new_resource(). Definition at line 398 of file llviewerregion.cpp. References gAgent, LLAgent::getPosAgentFromGlobal(), and mCenterGlobal. Definition at line 142 of file llviewerregion.h. Referenced by calculateCameraDistance(), and getCompositionXY(). Definition at line 213 of file llviewerregion.h. Referenced by getCompositionXY(), LLDrawPoolTerrain::render(), LLDrawPoolTerrain::renderFull2TU(), LLDrawPoolTerrain::renderFull4TU(), LLDrawPoolTerrain::renderFull4TUShader(), unpackRegionHandshake(), LLSurfacePatch::updateCompositionStats(), and LLSurfacePatch::updateTexture(). Definition at line 596 of file llviewerregion.cpp. References f, getCenterGlobal(), getComposition(), LLViewerLayer::getValueScaled(), gWorldPointer, and llabs(). Referenced by LLSurfacePatch::eval(), and LLPipeline::renderDebug(). Definition at line 1042 of file llviewerregion.cpp. References LLVOCacheEntry::getCRC(), LLVOCacheEntry::getDP(), llassert, mCacheLoaded, mCacheMap, mCacheMissCRC, mCacheMissFull, NULL, and LLVOCacheEntry::recordHit(). Definition at line 199 of file llviewerregion.h. Referenced by LLVLComposition::generateHeights(), getInfoString(), LLWorldMapView::handleToolTip(), LLSurface::initTextures(), LLViewerParcelMgr::processParcelProperties(), LLWorld::removeRegion(), send_sound_trigger(), LLAgent::setRegion(), LLAgent::setStartPosition(), LLAgent::teleportViaLocation(), LLVOAvatar::updateRegion(), and LLWorld::updateWaterObjects(). Definition at line 198 of file llviewerregion.h. Referenced by add_object(), LLWorld::addRegion(), LLViewerParcelMgr::buyPass(), callback_eject(), callback_freeze(), LLViewerParcelMgr::callbackDivideLand(), LLViewerParcelMgr::callbackJoinLand(), LLTaskInvFVBridge::commitBuyItem(), confirm_replace_attachment_rez(), container_inventory_arrived(), derez_objects(), LLSelectMgr::deselectObjectAndFamily(), LLSelectMgr::deselectObjectOnly(), LLWorld::disconnectRegions(), LLFloaterTopObjects::doToObjects(), LLToolDragAndDrop::dropObject(), getInfoString(), LLVOAvatar::getObjectHost(), LLFloaterReporter::getObjectInfo(), LLAgent::getRegionHost(), give_money(), handle_export_selected(), LLAvatarGiveCard::handleEvent(), LLObjectTouch::handleEvent(), LLFloaterCompileQueue::handleInventory(), LLNetMap::handleToolTip(), idle_startup(), LLFloaterAuction::initialize(), LLFloaterAbout::LLFloaterAbout(), LLLiveLSLEditor::loadAsset(), LLViewerObject::moveInventory(), LLPanelLandObjects::onClickRefresh(), LLLiveLSLEditor::onReset(), LLLiveLSLEditor::onRunningCheckboxClicked(), LLViewerObject::parameterChanged(), LLFloaterPay::payViaObject(), LLObjectBridge::performAction(), LLViewerObject::processTaskInv(), LLViewerParcelMgr::reclaimParcel(), LLPanelLandCovenant::refresh(), LLPanelEstateCovenant::refreshFromRegion(), LLPanelRegionInfo::refreshFromRegion(), remove_inventory_category_from_avatar_step2(), LLViewerObjectList::removeFromLocalIDTable(), LLViewerObject::removeInventory(), LLViewerParcelMgr::requestHoverParcelProperties(), LLViewerObject::requestInventory(), LLObjectEmitter::requestObjectInfo(), LLSelectMgr::requestObjectPropertiesFamily(), LLPermissionsView::revokePermissions(), LLViewerObject::saveScript(), LLViewerParcelMgr::selectLand(), LLSelectMgr::selectObjectOnly(), send_agent_pause(), send_agent_resume(), send_eject(), send_estate_message(), send_freeze(), send_other_clean_time_message(), send_parcel_select_objects(), send_return_objects_message(), LLSelectMgr::sendListToRegions(), LLViewerObject::sendMaterialUpdate(), LLAgent::sendMessage(), LLViewerParcelMgr::sendParcelAccessListRequest(), LLViewerParcelMgr::sendParcelAccessListUpdate(), LLViewerParcelMgr::sendParcelDeed(), LLViewerParcelMgr::sendParcelDwellRequest(), LLViewerParcelMgr::sendParcelGodForceOwner(), LLViewerParcelMgr::sendParcelGodForceToContent(), LLViewerParcelMgr::sendParcelPropertiesUpdate(), LLViewerParcelMgr::sendParcelRelease(), LLViewerObject::sendPositionUpdate(), LLAgent::sendReliableMessage(), LLFloaterReporter::sendReportViaLegacy(), LLViewerObject::sendRotationUpdate(), LLViewerObject::sendScaleUpdate(), LLViewerObject::sendShapeUpdate(), LLViewerObject::sendTEUpdate(), setCapability(), LLAgent::setRegion(), LLAgent::setStartPosition(), LLViewerParcelMgr::setupParcelBuy(), update_statistics(), LLFloaterBuyLandUI::updateCovenantInfo(), LLViewerObject::updateFlags(), LLViewerObject::updateInventory(), LLVOAvatar::updateTextures(), upload_done_callback(), and wear_inventory_category_on_avatar_step2(). Definition at line 972 of file llviewerregion.cpp. References from_region_handle(), getHandle(), getHost(), getName(), LLHost::getString(), x, and y. Definition at line 201 of file llviewerregion.h. Referenced by LLViewerParcelOverlay::addPropertyLine(), LLVOWater::createDrawable(), LLVOGrass::getGeometry(), LLToolBrushLand::handleMouseDown(), LLToolBrushLand::modifyLandInSelectionGlobal(), LLViewerWindow::mousePointOnLandGlobal(), LLViewerParcelMgr::renderOneSegment(), LLViewerParcelOverlay::renderPropertyLines(), LLWorld::resolveLandHeightGlobal(), LLWorld::resolveLandNormalGlobal(), LLWorld::resolveLandPatchGlobal(), LLWorld::resolveStepHeightGlobal(), unpackRegionHandshake(), and LLWorld::updateVisibilities(). Definition at line 810 of file llviewerregion.cpp. Definition at line 117 of file llviewerregion.h. Definition at line 146 of file llviewerregion.h. Referenced by LLToolBrushLand::alertNoTerraform(), LLAgent::buildLocationString(), LLVoiceClient::channelFromRegion(), LLStartUp::dispatchURL(), LLFloaterReporter::gatherReport(), getInfoString(), LLFloaterReporter::getObjectInfo(), LLPanelDirFindAll::getSearchURLSuffix(), handle_lure(), LLNetMap::handleToolTip(), is_agent_in_region(), LLFloaterAbout::LLFloaterAbout(), LLFloaterReporter::LLFloaterReporter(), LLPanelPick::onClickSet(), process_agent_movement_complete(), LLStatusBar::refresh(), LLPanelLandCovenant::refresh(), LLPanelObjectTools::refresh(), LLPanelEstateCovenant::refreshFromRegion(), LLPanelRegionTextureInfo::refreshFromRegion(), LLWorld::removeRegion(), LLAgent::setRegion(), LLVoiceClient::stateMachine(), trigger_hippo_bug(), and LLFloaterBuyLandUI::updateCovenantInfo(). Definition at line 699 of file llviewerregion.cpp. Definition at line 392 of file llviewerregion.cpp. References gAgent, LLAgent::getPosAgentFromGlobal(), and mOriginGlobal. Referenced by LLVOGrass::getGeometry(), getPosRegionFromAgent(), LLViewerObject::LLViewerObject(), LLVOGrass::plantBlades(), LLViewerParcelMgr::renderOneSegment(), LLViewerParcelOverlay::renderPropertyLines(), and LLVOVolume::updateRelativeXform(). Definition at line 138 of file llviewerregion.h. Referenced by idle_startup(), LLFloaterReporter::LLFloaterReporter(), LLPanelRegionTools::onSelectRegion(), operator<<(), CoarseLocationUpdate::post(), process_agent_movement_complete(), LLVOVolume::processUpdateMessage(), LLDrawPoolTerrain::renderFull2TU(), LLDrawPoolTerrain::renderFull4TU(), LLDrawPoolTerrain::renderFull4TUShader(), LLViewerParcelMgr::selectCollisionParcel(), LLViewerParcelMgr::sendParcelGodForceOwner(), LLAgent::setRegion(), and LLViewerParcelMgr::setupParcelBuy(). Definition at line 150 of file llviewerregion.h. Referenced by LLPanelEstateInfo::accessAddCore3(), LLPanelEstateInfo::accessCoreConfirm(), all_estates_text(), canManageEstate(), enable_region_owner(), LLViewerParcelMgr::reclaimParcel(), LLPanelLandInfo::refresh(), LLPanelLandGeneral::refresh(), LLPanelEstateInfo::refreshFromRegion(), and LLPanelRegionTerrainInfo::refreshFromRegion(). Definition at line 747 of file llviewerregion.cpp. References LLCircuit::findCircuit(), LLCircuitData::getPacketsLost(), gMessageSystem, llendl, llinfos, LLMessageSystem::mCircuitInfo, and mHost. Definition at line 128 of file llviewerregion.h. Referenced by LLViewerObject::isOverAgentOwnedLand(), LLViewerObject::isOverGroupOwnedLand(), LLViewerParcelMgr::isOwnedAt(), LLViewerParcelMgr::isOwnedOtherAt(), LLViewerParcelMgr::isOwnedSelfAt(), LLViewerParcelMgr::isSoundLocal(), and LLDrawPoolTerrain::renderOwnership(). Definition at line 798 of file llviewerregion.cpp. References gAgent, LLAgent::getPosAgentFromGlobal(), and getPosGlobalFromRegion(). Referenced by LLViewerObject::getPositionAgent(), LLRegionPosition::getPositionAgent(), LLViewerObject::setPositionEdit(), LLViewerObject::setPositionRegion(), and LLViewerObject::updatePositionCaches(). Definition at line 791 of file llviewerregion.cpp. Referenced by add_object(), LLWorld::clipToVisibleRegions(), getPosAgentFromRegion(), LLViewerObject::getPositionGlobal(), LLRegionPosition::getPositionGlobal(), LLViewerParcelMgr::processParcelProperties(), and LLFloaterGodTools::processRegionInfo(). Definition at line 805 of file llviewerregion.cpp. Referenced by LLViewerObject::setPositionAgent(), and LLViewerPartGroup::updateParticles(). Definition at line 784 of file llviewerregion.cpp. Referenced by LLViewerParcelMgr::callbackDivideLand(), LLViewerParcelMgr::callbackJoinLand(), LLWorld::clipToVisibleRegions(), LLToolDragAndDrop::dropObject(), LLViewerParcelMgr::inAgentParcel(), LLCloudGroup::inGroup(), LLViewerParcelMgr::isOwnedAt(), LLViewerParcelMgr::isOwnedOtherAt(), LLViewerParcelMgr::isOwnedSelfAt(), LLViewerParcelMgr::isSoundLocal(), pointInRegionGlobal(), process_agent_movement_complete(), LLViewerParcelMgr::processParcelProperties(), raycast_for_new_obj_pos(), LLToolBrushLand::render(), LLViewerParcelOverlay::renderPropertyLines(), LLViewerParcelMgr::requestHoverParcelProperties(), LLSurface::resolveHeightGlobal(), LLSurface::resolvePatchGlobal(), LLWorld::resolveRegionAgent(), LLWorld::resolveRegionGlobal(), LLWorld::resolveStepHeightGlobal(), LLViewerParcelMgr::selectLand(), LLViewerObject::setPositionAbsoluteGlobal(), LLViewerObject::setPositionGlobal(), LLRegionPosition::setPositionGlobal(), LLViewerParcelMgr::setupParcelBuy(), LLSurface::updatePatchVisibilities(), and LLCloudGroup::updatePuffs(). Definition at line 132 of file llviewerregion.h. Referenced by add_duplicate(), add_object(), LLToolBrushLand::canTerraform(), LLFloaterGodTools::computeRegionFlags(), LLPanelLandOptions::draw(), LLToolDragAndDrop::dropObject(), LLPanelLandOptions::onClickPublishHelp(), onClickScripts(), LLStatusBar::refresh(), LLPanelLandInfo::refresh(), LLPanelLandCovenant::refresh(), LLPanelLandGeneral::refresh(), LLPanelEstateCovenant::refreshFromRegion(), and LLFloaterBuyLandUI::updateCovenantInfo(). Definition at line 204 of file llviewerregion.h. Referenced by process_agent_movement_complete(), and process_chat_from_simulator(). Definition at line 366 of file llviewerregion.h. Definition at line 396 of file llviewerregion.h. Definition at line 158 of file llviewerregion.h. Definition at line 430 of file llviewerregion.cpp. Definition at line 371 of file llviewerregion.h. Definition at line 135 of file llviewerregion.h. Definition at line 365 of file llviewerregion.cpp. Referenced by audio_update_wind(), LLSpatialPartition::calcDistance(), LLViewerCamera::cameraUnderWater(), handle_region_dump_settings(), LLVOAvatar::idleUpdate(), LLPipeline::postSort(), LLDrawPoolSky::render(), LLDrawPoolGround::render(), setup_clip_plane(), LLVOSky::updateFog(), and LLVOSky::updateGeometry(). Definition at line 178 of file llviewerregion.h. Referenced by LLWorld::clipToVisibleRegions(), and LLAgent::teleportViaLocation(). Definition at line 147 of file llviewerregion.h. Definition at line 556 of file llviewerregion.cpp. References LLViewerParcelOverlay::idleUpdate(), LLSurface::idleUpdate(), mLandp, and mParcelOverlay. Definition at line 144 of file llviewerregion.cpp. References FALSE, mAlive, mBitsIn, mLastBitsIn, mLastNetUpdate, mLastPacketsIn, mLastPacketsLost, mLastPacketsOut, mPacketsIn, mPacketsLost, mPacketsOut, mPingDelay, and LLTimer::reset(). Definition at line 154 of file llviewerregion.h. Referenced by LLPanelEstateInfo::accessCoreConfirm(), all_estates_text(), canManageEstate(), LLPanelEstateInfo::refreshFromRegion(), and LLPanelRegionTerrainInfo::refreshFromRegion(). Definition at line 826 of file llviewerregion.cpp. References FALSE, LLViewerParcelOverlay::isOwnedGroup(), and mParcelOverlay. Definition at line 815 of file llviewerregion.cpp. References FALSE, LLViewerParcelOverlay::isOwnedSelf(), and mParcelOverlay. Definition at line 386 of file llviewerregion.h. Referenced by LLFloaterWorldMap::draw(), LLWorldEnableTeleportHome::handleEvent(), LLAgent::inPrelude(), and process_improved_im(). Definition at line 182 of file llviewerregion.cpp. References LLFile::fopen(), gDirUtilp, LLDir::getDirDelimiter(), LLDir::getExpandedFilename(), LLVOCacheEntry::getLocalID(), i, INDRA_OBJECT_CACHE_VERSION, LLDLinked< Type >::insert(), LL_PATH_CACHE, llendl, llinfos, llwarns, mCacheEnd, mCacheEntriesCount, mCacheID, mCacheLoaded, mCacheMap, LLUUID::mData, mHandle, NULL, REGION_WIDTH_UNITS, S32, TRUE, and UUID_BYTES. Definition at line 1415 of file llviewerregion.cpp. References count, llendl, llinfos, and mCapabilities. Definition at line 761 of file llviewerregion.cpp. References FALSE, getPosRegionFromGlobal(), LLVector3::mV, mWidth, TRUE, VX, and VY. Definition at line 524 of file llviewerregion.cpp. References LLFloaterReporter::processRegionInfo(), LLFloaterRegionInfo::processRegionInfo(), and LLFloaterGodTools::processRegionInfo(). Definition at line 437 of file llviewerregion.cpp. Definition at line 534 of file llviewerregion.cpp. Definition at line 1076 of file llviewerregion.cpp. References _PREHASH_AgentData, _PREHASH_AgentID, _PREHASH_CacheMissType, _PREHASH_ID, _PREHASH_ObjectData, _PREHASH_RequestMultipleObjects, _PREHASH_SessionID, LLMessageSystem::addU32Fast(), LLMessageSystem::addU8Fast(), LLMessageSystem::addUUIDFast(), FALSE, gAgent, LLAgent::getID(), LLAgent::getSessionID(), gMessageSystem, i, mCacheMissCRC, mCacheMissFull, LLMessageSystem::newMessageFast(), LLMessageSystem::nextBlockFast(), S32, sendReliableMessage(), and TRUE. Definition at line 270 of file llviewerregion.cpp. References LLDLinked< Type >::deleteAll(), LLFile::fopen(), gDirUtilp, LLDir::getDirDelimiter(), LLDir::getExpandedFilename(), LLDLinked< Type >::getNext(), INDRA_OBJECT_CACHE_VERSION, LLDLinked< Type >::init(), LL_PATH_CACHE, llendl, llwarns, mCacheEnd, mCacheEntriesCount, mCacheID, mCacheLoaded, mCacheMap, mCacheStart, LLUUID::mData, mHandle, REGION_WIDTH_UNITS, S32, LLDLinked< Type >::unlink(), and UUID_BYTES. Definition at line 338 of file llviewerregion.cpp. References gMessageSystem, mHost, and LLMessageSystem::sendMessage(). Definition at line 343 of file llviewerregion.cpp. References gMessageSystem, mHost, and LLMessageSystem::sendReliable(). Referenced by handle_sit_or_stand(), and requestCacheMisses(). Definition at line 89 of file llviewerregion.h. Definition at line 95 of file llviewerregion.h. Definition at line 90 of file llviewerregion.h. Definition at line 91 of file llviewerregion.h. Definition at line 112 of file llviewerregion.h. Referenced by LLFloaterGodTools::processRegionInfo(), and unpackRegionHandshake(). Definition at line 94 of file llviewerregion.h. Definition at line 176 of file llviewerregion.h. Definition at line 1387 of file llviewerregion.cpp. References getHost(), mCapabilities, mEventPoll, mHost, NULL, and LLHTTPSender::setSender(). Referenced by BaseCapabilitiesComplete::result(), and setSeedCapability(). Definition at line 348 of file llviewerregion.cpp. Referenced by setAllowDamage(), setAllowDirectTeleport(), setAllowLandmark(), setAllowSetHome(), setBlockFly(), setResetHomeOnTeleport(), and setSunFixed(). Definition at line 153 of file llviewerregion.h. Definition at line 118 of file llviewerregion.h. Definition at line 376 of file llviewerregion.cpp. References calculateCenterGlobal(), mCloudLayer, mLandp, mOriginGlobal, mWind, LLCloudLayer::setOriginGlobal(), LLWind::setOriginGlobal(), and LLSurface::setOriginGlobal(). Definition at line 149 of file llviewerregion.h. Referenced by LLDispatchEstateUpdateInfo::operator()(), and unpackRegionHandshake(). Definition at line 370 of file llviewerregion.cpp. Referenced by process_sim_stats(), LLFloaterGodTools::processRegionInfo(), and unpackRegionHandshake(). Definition at line 205 of file llviewerregion.h. Definition at line 403 of file llviewerregion.cpp. References mName, mZoning, S32, and LLStringBase< char >::stripNonprintable(). Definition at line 92 of file llviewerregion.h. Definition at line 1338 of file llviewerregion.cpp. References LLSD::append(), BaseCapabilitiesComplete::build(), LLSD::emptyArray(), getCapability(), llendl, llinfos, llwarns, mCapabilities, mEventPoll, NULL, LLHTTPClient::post(), and setCapability(). Referenced by idle_startup(), LLEstablishAgentCommunication::post(), process_crossed_region(), and process_teleport_finish(). Definition at line 157 of file llviewerregion.h. Definition at line 93 of file llviewerregion.h. Definition at line 386 of file llviewerregion.cpp. Definition at line 360 of file llviewerregion.cpp. Definition at line 485 of file llviewerregion.cpp. References SIM_ACCESS_MATURE, SIM_ACCESS_MIN, SIM_ACCESS_PG, SIM_ACCESS_STR, and SIM_ACCESS_TRIAL. Definition at line 1191 of file llviewerregion.cpp. References LLMessageSystem::addU32(), LLMessageSystem::addUUID(), LLSurface::dirtyAllPatches(), gAgent, LLMessageSystem::getBOOL(), getComposition(), LLMessageSystem::getF32(), LLAgent::getID(), getLand(), LLVLComposition::getParamsReady(), LLMessageSystem::getSender(), LLAgent::getSessionID(), LLMessageSystem::getString(), LLMessageSystem::getU32(), LLMessageSystem::getU8(), LLMessageSystem::getUUID(), gMessageSystem, loadCache(), LLMessageSystem::newMessage(), LLMessageSystem::nextBlock(), S32, LLMessageSystem::sendReliable(), setBillableFactor(), setCacheID(), LLVLComposition::setDetailTextureID(), LLVLComposition::setHeightRange(), setIsEstateManager(), setOwner(), LLVLComposition::setParamsReady(), setRegionFlags(), setRegionID(), setRegionNameAndZone(), setSimAccess(), LLVLComposition::setStartHeight(), and setWaterHeight(). Definition at line 922 of file llviewerregion.cpp. References _PREHASH_Index, _PREHASH_Location, _PREHASH_Prey, _PREHASH_X, _PREHASH_Y, _PREHASH_You, _PREHASH_Z, count, LLMessageSystem::getNumberOfBlocksFast(), LLMessageSystem::getS16Fast(), LLMessageSystem::getU8Fast(), i, LLAvatarTracker::instance(), LLVector3d::mdV, mMapAvatars, mOriginGlobal, S32, LLAvatarTracker::setTrackedCoarseLocation(), VX, VY, and VZ. Definition at line 716 of file llviewerregion.cpp. References LLStat::addValue(), FALSE, LLCircuit::findCircuit(), LLCircuitData::getBytesIn(), LLTimer::getElapsedTimeAndResetF32(), LLCircuitData::getPacketsIn(), LLCircuitData::getPacketsLost(), LLCircuitData::getPacketsOut(), LLCircuitData::getPingDelay(), gMessageSystem, mAlive, mBitsIn, mBitStat, LLMessageSystem::mCircuitInfo, mDeltaTime, mHost, mLastBitsIn, mLastNetUpdate, mLastPacketsIn, mLastPacketsLost, mLastPacketsOut, mPacketsIn, mPacketsLost, mPacketsLostStat, mPacketsOut, mPacketsStat, mPingDelay, and TRUE. Definition at line 704 of file llviewerregion.cpp. Definition at line 265 of file llviewerregion.h. Referenced by LLWorld::addRegion(), initStats(), and updateNetStats(). Definition at line 324 of file llviewerregion.h. Referenced by getBillableFactor(), and setBillableFactor(). Definition at line 309 of file llviewerregion.h. Referenced by initStats(), and updateNetStats(). Definition at line 267 of file llviewerregion.h. Definition at line 334 of file llviewerregion.h. Referenced by cacheFullUpdate(), dumpCache(), LLViewerRegion(), loadCache(), and saveCache(). Definition at line 335 of file llviewerregion.h. Referenced by cacheFullUpdate(), dumpCache(), loadCache(), and saveCache(). Definition at line 343 of file llviewerregion.h. Referenced by loadCache(), saveCache(), and setCacheID(). Definition at line 331 of file llviewerregion.h. Referenced by getDP(), loadCache(), and saveCache(). Definition at line 332 of file llviewerregion.h. Referenced by cacheFullUpdate(), getDP(), loadCache(), and saveCache(). Definition at line 337 of file llviewerregion.h. Referenced by getDP(), and requestCacheMisses(). Definition at line 336 of file llviewerregion.h. Referenced by addCacheMissFull(), getDP(), and requestCacheMisses(). Definition at line 333 of file llviewerregion.h. Referenced by cacheFullUpdate(), dumpCache(), LLViewerRegion(), and saveCache(). Definition at line 326 of file llviewerregion.h. Referenced by calculateCameraDistance(), and LLViewerRegion::CompareDistance::operator()(). Definition at line 346 of file llviewerregion.h. Referenced by getCapability(), logActiveCapabilities(), setCapability(), and setSeedCapability(). Definition at line 285 of file llviewerregion.h. Referenced by calculateCenterGlobal(), getCenterAgent(), and getCenterGlobal(). Definition at line 262 of file llviewerregion.h. Referenced by LLWorld::addRegion(), connectNeighbor(), disconnectAllNeighbors(), idle(), setOriginGlobal(), and ~LLViewerRegion(). Definition at line 320 of file llviewerregion.h. Referenced by getComposition(), LLViewerRegion(), and ~LLViewerRegion(). Definition at line 317 of file llviewerregion.h. Definition at line 348 of file llviewerregion.h. Referenced by setCapability(), setSeedCapability(), and ~LLViewerRegion(). Definition at line 288 of file llviewerregion.h. Referenced by getHandle(), loadCache(), and saveCache(). Definition at line 289 of file llviewerregion.h. Referenced by getHost(), getPacketsLost(), operator<<(), sendMessage(), sendReliableMessage(), setCapability(), updateNetStats(), and ~LLViewerRegion(). Definition at line 304 of file llviewerregion.h. Referenced by isEstateManager(), and setIsEstateManager(). Definition at line 281 of file llviewerregion.h. Referenced by calculateCenterGlobal(), connectNeighbor(), disconnectAllNeighbors(), forceUpdate(), getLand(), getLandHeightRegion(), getWaterHeight(), idleUpdate(), LLViewerRegion(), setOriginGlobal(), setWaterHeight(), and ~LLViewerRegion(). Definition at line 310 of file llviewerregion.h. Definition at line 307 of file llviewerregion.h. Definition at line 311 of file llviewerregion.h. Definition at line 315 of file llviewerregion.h. Definition at line 313 of file llviewerregion.h. Definition at line 277 of file llviewerregion.h. Definition at line 276 of file llviewerregion.h. Referenced by CoarseLocationUpdate::post(), and updateCoarseLocations(). Definition at line 325 of file llviewerregion.h. Referenced by getMaxTasks(), and setMaxTasks(). Definition at line 297 of file llviewerregion.h. Referenced by getName(), and setRegionNameAndZone(). Definition at line 284 of file llviewerregion.h. Referenced by calculateCenterGlobal(), getOriginAgent(), getOriginGlobal(), getPosGlobalFromRegion(), getPosRegionFromGlobal(), LLViewerRegion(), setOriginGlobal(), and updateCoarseLocations(). Definition at line 301 of file llviewerregion.h. Definition at line 308 of file llviewerregion.h. Definition at line 314 of file llviewerregion.h. Definition at line 269 of file llviewerregion.h. Definition at line 312 of file llviewerregion.h. Definition at line 268 of file llviewerregion.h. Definition at line 263 of file llviewerregion.h. Referenced by dirtyHeights(), forceUpdate(), getParcelOverlay(), idleUpdate(), isOwnedGroup(), isOwnedSelf(), LLViewerRegion(), LLViewerParcelMgr::processParcelOverlay(), renderPropertyLines(), and ~LLViewerRegion(). Definition at line 316 of file llviewerregion.h. Referenced by getNetDetailsForLCD(), initStats(), and updateNetStats(). Definition at line 322 of file llviewerregion.h. Referenced by getAllowDamage(), getAllowDirectTeleport(), getAllowLandmark(), getAllowSetHome(), getAllowTerraform(), getBlockFly(), getRegionFlags(), getResetHomeOnTeleport(), getRestrictPushObject(), getSunFixed(), isPrelude(), setFlags(), and setRegionFlags(). Definition at line 292 of file llviewerregion.h. Referenced by getRegionID(), and setRegionID(). Definition at line 323 of file llviewerregion.h. Referenced by getSimAccess(), getSimAccessString(), and setSimAccess(). Definition at line 294 of file llviewerregion.h. Referenced by getTimeDilation(), and setTimeDilation(). Definition at line 286 of file llviewerregion.h. Referenced by calculateCenterGlobal(), getWidth(), LLViewerRegion(), and pointInRegionGlobal(). Definition at line 261 of file llviewerregion.h. Referenced by LLWorld::addRegion(), LLVolumeImplFlexible::doFlexibleUpdate(), idle(), LLVOTree::idleUpdate(), LLVOTree::LLVOTree(), setOriginGlobal(), LLViewerPartGroup::updateParticles(), and LLCloudGroup::updatePuffs(). Definition at line 298 of file llviewerregion.h. Referenced by getZoning(), and setRegionNameAndZone().